Emergency Preparedness and Recovery in a Hospital - A Great Professor for a Day! Yesterday, we had the pleasure of hearing Mr. Brian Rust, the Director of Security Services at Cooley Dickinson Hospital, which is now owned by Mass General Hospital, speak to my Humanitarian Logistics and Healthcare class. Mr. Rust was originally scheduled to speak the week before but he had several emergencies to contend with and I am not talking about patient emergencies, so he had to reschedule. Mr. Rust was a terrific Professor for a Day - sharing with us the planning behind emergency preparedness in a hospital, which aims to provide "the best healthcare in an appropriate setting." Last week he had to contend with multiple emergencies, beginning with a computer failure on Monday, which was fixed by a Cisco switch brought in from eastern MA, followed by complete communication failure on Wednesday (supposedly not related to the Monday one) with no Internet or phone lines available. Hence, medical records could not be accessed, and CAT scans and X-rays could not be read. Back to documentation on paper, which he said the older healthcare providers were comfortable with since they had used such basic approaches earlier in their careers, in contrast to the more recently trained healthcare workers, which are so dependent on computers. Appointments had to be cancelled. This major disruption was fixed on Wednesday but then Wednesday afternoon a sprinkler pipe burst and flooded the back of the Emergency Room with thousands of gallons of water pouting in. Moreover, the water was not clean but dark and the texture of oil, he said. There is a new cancer facility being constructed above the Emergency Room area and it seems that the pipe was not properly insulated. With facility experts on hand (luckily, he said, not everything has been outsourced) in a few hours the area was cleaned up and disinfected. During that period, however, ambulances had to be diverted to other hospitals, which can be "expensive" in terms of additional time needed for delivering the patient and in that Cooley Dickinson loses any financial compensation since it did not serve those patients. He noted that 4 ambulances were diverted. His talk was fascinating and illustrated how much a community relies on a hospital as do first responders. He spoke on the importance of emergency preparedness and justifying it to highers-up and even mentioned that 70 staff members slept in the hospital during our recent snowstorm(s) since transportation may have been an issue and staff was needed. Hence, more food had to be supplied. There were many very interesting points that he made, sometimes in a graphical way, as when he discussed "Med-slides," which are used to move patients down stairs in case of a power failure with elevators not functioning. He also noted that medicines, typically, arrive "just-in-time" on a daily basis so when there may be transport failures that could be an issue. He spoke about a federal mandate that requires hospitals to be able to recover in 96 hours and maintain operations during that period. We very much appreciate Mr. Rust sharing his wealth of expertise with us and thank Cooley Dickinson for all it does for healthcare in our community. His presentation and the discussions will keep us thinking and reflecting for a long time to come! Yesterday, the new Executive Director of the Pioneer Valley Chapter of the American Red Cross in western Massachusetts, Ms. Kim Goulette, spoke to the students in my Humanitarian Logistics and Healthcare class. Ms. Goulette assumed this position after the retirement of Mr. Rick Lee, who had served with the Red Cross for over 3 decades and who spoke to my students in previous years on 2 separate occasions. As Kim said to the students: "She has big shoes to fill!" She provided the class with a brief history of the Red Cross and Clara Barton, of course, and emphasized what is unique about the Red Cross as a nonprofit organization, which was very interesting. The Red Cross provides immediate response to people in need because of disasters and, in a sense, consists of "first responders," about 97% of whom are volunteers. Whether it is food, blankets, drinks, or even teddy bears for children in the nearterm, or shelter, food, and resources during the recovery phase, Red Cross volunteers are there to help. I saw such teddy bears last spring when I had the honor of attending the Hometown Heroes breakfast in Springfield as a guest of Mr. Rick Lee's. Ms. Goulette spoke about the big fire in Amherst last summer in an apartment complex at which she assisted after only about 1 week on the job.She also spoke about the role of the Red Cross in feeding the National Guardsmen who were deployed to eastern MA because of the multiple immense snowfalls this winter that disrupted lives, transportation, and other infrastructure because frozen and burst pipes and collapsed roofs. She mentioned the gains for the community through the new Red Cross Springfield headquarters with its activities, including blood donations, under one roof. This consolidation has resulted in increased efficiencies in disaster responses. Ms. Goulette highlighted the various activities of the Red Cross in communities that some may not be as aware of, such as the call centers for military families (Rick Lee's brilliant idea), CPR training and certification, youth programs, international programs, and volunteer training. She shared many fascinating facts with us such as that every 9 minutes the Red Cross is responding to a disaster and it spends $360 million preparing for disasters. It is entirely dependent on donors for funding and she mentioned the challenges associated with financial donations that are earmarked for a particular disaster. In the US, there are 61,000 shelter sites, which include schools, and with the mobile kitchens, the RC is able to serve up to 1 million meals a day. I was curious so I asked what meals the National Guardsmen were provided in the Boston area recently and she mentioned chicken soup, peanut butter and jelly sandwiches, hot chocolate, and coffee. The volunteers get woken up at 2AM and then retrieved the supplies for delivery in eastern MA. I found the challenging new landscape of blood donations and collections very interesting since, along with two of my doctoral students, who are now professors, Amir H. Masoumi, and Min Yu, I wrote several articles on blood supply chains. She mentioned "competition" in the blood supply chain industry, which one would not normally think of, different surgical procedures, which are resulting in less blood loss and, hence, need for transfusions, and also the emphasis on decreasing wastage. The Red Cross now supplies only about 40% of the blood in the US. We in Operations Management always care about supply meeting demand and, in this sector, there is the perishability aspect of blood, and uncertainty as to demand (for unscheduled procedures due to accidents, for example) as well as to supply (will the donors show up and, if so, how many). There were many questions from the students and I am sure many thoughtful reflections that continue. Thanks to Ms. Kim Goulette for the great lecture and to the American Red Cross and other Red Cross societies for great work in disaster relief and reducing human suffering! This morning, in sunny and warm Florida, my doctoral student Dong "Michelle" Li will be presenting one of our latest supply chain papers at the World Congress of Global Optimization. The paper is: Supply Chain Performance Assessment and Supplier and Component Importance Identification in a General Competitive Multitiered Supply Chain Network Model, Dong Li and Anna Nagurney. Research on the topic was inspired, in part, by discussions and talks at the fabulous Workshop on Vulnerability and Resilience of Supply Chains in Zurich, Switzerland in September 2013 at which I had the pleasure of being an invited speaker. It was also great to see Dr. Yossi Sheffi of MIT, the author of The Resilient Enterprise, there. I could not resist hugging him, since he was my host at MIT when I held an NSF Visiting Professorship for Women there in the Center for Transportation and Logistics. Given that the number of disasters is growing, as well as the number of people affected by disasters, it makes sense to capture the interdependencies in today's complex supply chain networks and their roles in the Network Economy. Our research reported on the above paper and talk develops a multitiered competitive supply chain network game theory model, which includes the supplier tier. The firms are differentiated by brands and can produce their own components, as reflected by their capacities, and/or obtain components from one or more suppliers, who also are capacitated. The firms compete in a Cournot-Nash fashion, in quantities, whereas the suppliers compete a la Bertrand, in prices. All decision-makers seek to maximize their profits with consumers reflecting their preferences through the demand price functions associated with the demand markets for the firms’ products. We construct supply chain network performance measures for the full supply chain and the individual firm levels that assess the efficiency of the supply chain or firm, respectively, and also allow for the identification and ranking of the importance of suppliers as well as the components of suppliers with respect to the full supply chain or individual firm. The framework is then illustrated through a series of numerical supply chain network examples. The framework allows for the identification of the importance of components and suppliers to the individual firm supply chains and to the supply chain network of multiple firms. The latter can be very useful to policy makers in determining the impact of the removal of nodes from an industry supply chain due to natural disasters, business failures, etc. At the Isenberg School of Management, we pride ourselves on our students being resilient and "gritty" even. This winter has certainly put the faculty, students, and staff to the test. For example, WWLP.com is reporting that: Temperatures dropped to -19º at the Westover Air Reserve Base in Chicopee Saturday morning. This broke the previous record low of -6º set back in 1950. To put this cold in perspective, -19º is the coldest low we’ve ever had in the lower Pioneer Valley in February. This February, we have had 2 cancellations of classes at UMass Amherst on a Monday (I teach Mondays) due to big snowfalls, and a burst pipe that flooded our Isenberg School atrium and a computer lab below. I am not even acknowledging the later start times because the parking lots and roads and walkways needed clearing. Because of the frigid weather and snowstorms, I have also had to reschedule 2 guest speakers in my Humanitarian Logistics class and I so much appreciate the speakers' flexibility! The most recent speaker had to deal not only with a loss of communications (computer and phone) in his healthcare organization but also with a flood in one of the principal rooms because of a burst sprinkler pipe! He told me that he will have many stories to share with my students later this week. And, yesterday, I heard from one of my former doctoral students, who is now an Assistant Professor and lives in eastern MA. In the middle of the night last weekend (after Valentine's Day) his living room and basement were flooded when the sprinkler went off. He and his wife and young child now have to relocate to a hotel for a month so that the walls in the flooded rooms can be torn down and replaced because of all the water damage. Somehow in western MA, our mobility, despite the horrid February, has not been drastically affected. (I will not share with you the multiple schedules that had to be updated for prospective faculty interview candidates because of flight cancellations. The search is now over and our offer has been accepted so we will have a great new colleague in the Fall). The situation is even worse in Boston and Cambridge in eastern MA! The winter of 2015 with 7 feet of snow already having fallen in eastern MA (and topping records in Buffalo) has had a tremendous negative effect on public transportation with suffering commuters having to contend with complete shutdowns of the MBTA for days on end, major delays, and with serious disruptions to businesses and individuals. Police even had to transport certain healthcare professionals to work! I was contacted by a journalist last week to offer suggestions on how to remove the snow so offered ideas on the use of freight trains to transport the snow out to warmer climes and, posisbly, drier ones, as well. Last week, I was telling my students (we were discussing risk management and emergency preparedness) about Jane Garvey, who used to live in Amherst and was head of the FAA during 9/11 and responsible for managing air traffic control that horrific day. I had the great honor of receiving an award named after her, the Jane Garvey Transportation Leadership Award, which I treasure. Last night, on the evening news, because of the MBTA issues this winter, Governor Charlie Baker (who has been contending with water leaks in his home as well), appointed a panel to review the MBTA and Jane Garvey is one of the seven members of the panel with the charge to find long-term solutions for the MBTA's financial and operational woes.
" It's a system that is so critical to the economy and so critical to the state and the region. We all have I think an interest in seeing it run well." I completely agree with Garvey. (I wrote a post on her a while back.) I had the pleasure of meeting her at a dinner party hosted by a senior colleague of mine, Professor Joe Balintfy, who has since passed away. He was a neighbor of hers on Blue Hills Road in Amherst. I have spent 3 years living in Cambridge - the first two when I was a Visiting Scholar at the Center for Transportation & Logistics at MIT (under a wonderful NSF Visiting Professorship for Women grant that I had received) and then a Visiting Scholar at the Sloan School at MIT. In 2005-2006, I was at the other institution in Cambridge, on my sabbatical, as a Science Fellow at the Radcliffe Institute for Advanced Studies at Harvard University. The MBTA Red Line was how I got around when I was not walking from place to place or taking a Peter Pan bus back to Amherst on some weekends and holidays. And now the Peter Pan busses, based in Springfield, are being used to shuttle commuters in eastern MA because of the MBTA transit fiasco! And just to end on a positive note, yesterday, one of my colleagues and collaborators at the University of Gothenburg in Sweden, Professor Jonas Floden, emailed me the photos below which he took close to his home on the island of Donso. Yes, there are spring flowers now in Sweden! So, just hang in there - we will make it through this winter in Massachusetts! It has been a very cold and snowy February in Massachusetts and New England. The snow and freezing temperatures have resulted in many disruptions from our university being closed on 2 successive Mondays to roofs collapsing because of the snow and pipes bursting. Last February, I had the pleasure of going to a conference in Florida and although it was for a very short time - 2 to 3 days only, just seeing the greenery and experiencing warmth and sunshine outdoors was restorative. This year, I was hoping to get away for a short period of time to also break the monotony of the snowy landscape that has been the scenery for many weeks. However, since I teach two classes on Mondays I can't afford to go away. 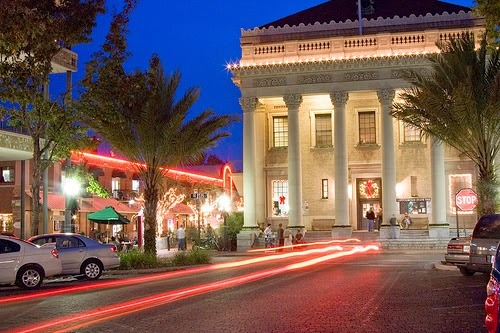 Luckily, I had submitted a paper with one of my doctoral students, Dong "Michelle" Li, and she will be flying to Gainesville, Florida on Sunday to present our paper, Supply Chain Performance Assessment and Supplier and Component Importance Identification in a General Competitive Multitiered Supply Chain Network Model. She will be speaking at the World Congress on Global Optimization: WCGO 2015. and will be presenting our paper, bright and early, next Monday morning. I asked Michelle to bring back a lot of photos so at least we can enjoy Florida vicariously! Last May, I had the pleasure of speaking in warm and beautiful Erice, Sicily on Sustainable Supply Chain Networks for Sustainable Cities, as part of the Workshop on Energy, Cities, and Control of Complex Systems organized by Drs. Adilson Motter and Robert Schock. I posted some photos of the venue at the Ettore Majorana Scientific Centre, the workshop participants, and the sights (and even food) along with some reflections on this blog. Now, I am very pleased to share with you that, through the efforts of Dr. Schock and Dr. Motter, the report on the workshop findings is now posted. Also, all the presentations are also posted. Thanks to the organizers of this great workshop as well as to the Energy Permanent Monitoring Panel, which is part of the World Federation of Scientists, for providing a homebase for our report and all the presentations. A direct link to my presentation is here. I guess the audience enjoyed my presentation (and I certainly did theirs) since I was invited to speak on the topic again in Berlin, Germany next month. We are having discussions on a possible follow on workshop, which is certainly needed, so stayed tuned and stay warm! 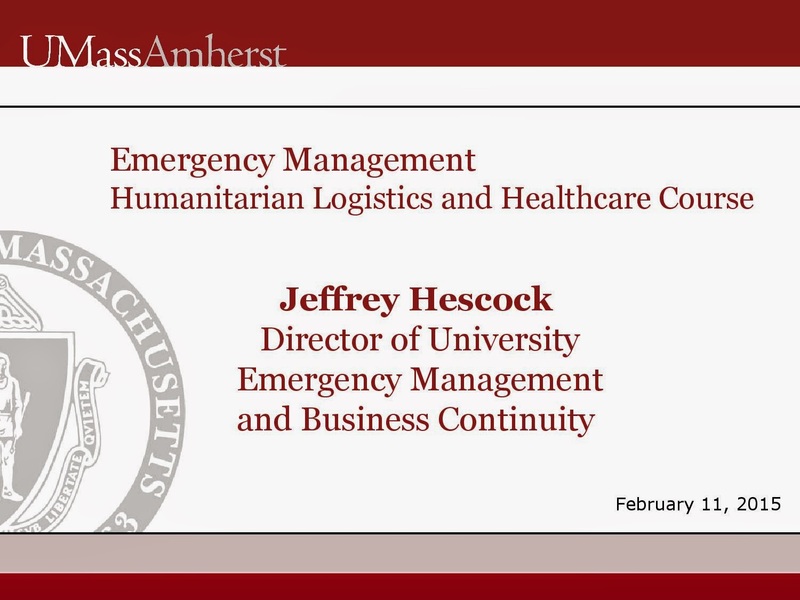 Yesterday, we had the pleasure of hearing Mr. Jeff Hescock, the Director of Emergency Management and Business Continuity at UMass Amherst, speak in my Humanitarian Logistics and Healthcare class at the Isenberg School of Management. Jeff has been at UMass Amherst since the Fall of 2013 and, previoously, had worked in a similar capacity at the UMass President's Office. He has also worked for the Massachusetts Emergency Management Agency (MEMA) and in the private sector, so he was a perfect guest speaker and a great Professor for a Day! We had to do some disruption management, since his talk was originally scheduled for this past Monday, which coincided with the second major snowstorm and with the university closing, again. I had seen the forecast last week and Mr. Hescock was able to reschedule - thank you very much! Mr. Hescock made the importance of emergency management, especially in a university setting, come alive. He has graciously allowed us to post his lecture slides, which you can download here. He spoke about the Clery Act, the massacre at Virgina Tech in 2007 in which 32 people lost their lives, and how these impacted colleges and universities, UMass Amherst is, in a sense, its own "city," and the legislature considers it as such. With 28,000 students, there are always challenges and, hence, emergency preparedness is so important! the UMass President's Office. He spoke how the UMass Dartmouth campus was evacuated and the Dartmouth High School was a staging area to reunite those evacuated with families and friends. were so impressed by his emphasis also on business continuity and the criticality of academics, research, and reputation! He also shared with us many personal experiences, such as the consulting project he had after a company's toilet overflowed overnight damaging all the paper records and computers! He also spoke about the gas leak close to campus last summer, which I remember well, and also of how well the students handled themselves after the Patriots' win of the Super Bowl recently. Mr. Hescock emphasized the importance of public information dissemination and appropriate media attention to events (before, during, and post). Of course, the students also appreciated hearing about who decides whether to call it a snowday and cancel classes - Mr. Hescock gets the phone call at 4AM to start the discussions with info from the National Weather Service, the Physical Plant folks, etc. and the text alerts are sent out shortly after 5AM. He spoke about most always being close to their phones for text message receipts and may not check emails as regularly. He also spoke about the UMass Amherst homepage being updated in case of closings and other important information. The workers did a great job cleaning the parking roads and walkways after the last snowstorm and Hescock noted that some of them actually "shelter in place" and sleep on campus. Very impressive is how the organization and vice chancellors, in charge, meet regularly to identify lessons learned," post events - whether natural or man-made ones. Everyone who was at Mr. Hescock's guest lecture today benefited from your exceptional expertise and practical know-how and your willingness to answer the students' numerous questions. We are very lucky to have him at UMass. I have been doing more reflecting on the great Women of Isenberg Conference that took place this past Saturday and, as promised, am writing this blogpost to capture some of the messages in the session, Building Your Brand I that I was a panelist on, and also the followon one, Building your Brand II. Our great panel moderator was Caroline Malloy, Isenberg School '15, who is a Management major. 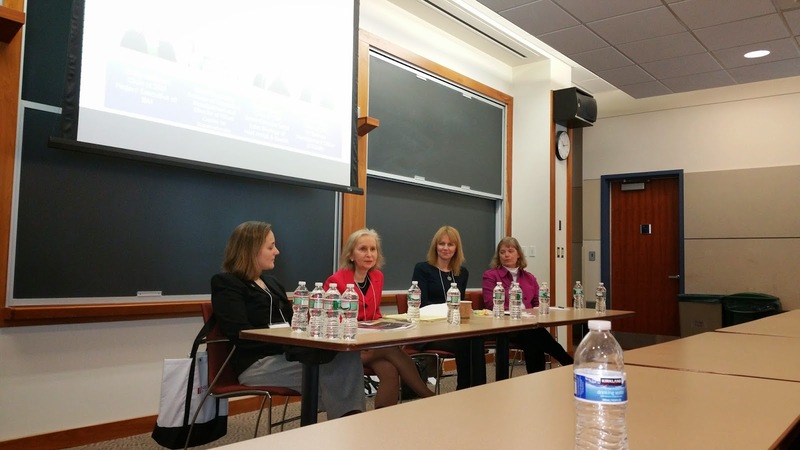 Joining me on the panel were: Natty Hoffman, Denise Durgin, and Linda Ronan - all of whom are Isenberg alums. A brief summary of our backgrounds can be found here. Caroline had earlier sent us the questions that we would be asked, which are below, so that we could prepare. 1. How have you cultivated your brand? Discuss what you believe are the critical components to building your brand and differentiating yourself in the workplace. 2. Have you leveraged social media to establish yourself? What limitations, if any, did you encounter or words of caution you might have? 3. The term "building your brand" to me is synonymous with creating your "story." What is your advice to college students as we begin to create our "story" for today's job marketplace? 4. What are the steps students can take today to begin building their brand that will differentiate themselves as they prepare for life after graduation? The moderator first had us introduce ourselves and then asked each of us the same question and we answered in round robin fashion. It was great to see so many students in the audience - undergrads, MBA students, and even my PhD student, plus quite a few faculty and staff, and alums. Even one of my male undergrads came to the panel.Plus, the daughter of one of our panelists, Linda Ronan, who is a student at Isenberg, was also in the audience - very cool! and produced this very short video clip. Below, I provide some of the "answers" to the above questions, interweaving also what I had prepared as notes. The themes that continued to resonate both in the afternoon and other sessions that I managed to attend I will further emphasize. You have to be excellent in your work and do it with energy and passion and support you organization. Find your passion and work will be a pleasure. You have to be visible - this means different things at different stages of your career. Take on challenging tasks and be a true contributor . Make sure that the right people know of your contributions and successes. Write Letters to the Editor and OpEd pieces. Always be positive (several students throughout the day told me how much they appreciated this comment, so thanks). Positive energy is uplifting to you and those around you. There is too much negativity in the world. Build a good team of supporters both below and above you. As you move up, be sure to help others and to mentor others. Keep your personal and professional social media separate. The importance of this was emphasized by many in the morning and afternoon. Some are not even on Facebook to make sure that only a professional image is projected. Keep in mind that what is said in social media may become public. Don't say anything that you may regret later and may be held accountable for. Use social media to give pats on the back, and to celebrate the accomplishments of others - this will be very much appreciated and is something that I try to do regularly, both on this blog and through Twitter. At times, I also follow up with personal notes. Congratulate students, faculty, and other co-workers on their achievements. As a blogger, I receive many thank you's for the posts that I write from professionals and students alike. This is a time-consuming task but it is important to get the news out, to recognize and celebrate achievements, and to offer advice and commentary and also to share advances in research and teaching. Due to blogging, I have been interviewed by journalists and have had quite a few speaking engagements both in NYC and internationally. I have received many messages stating appreciation for people that I have acknowledged that even their organizations or universities had not. Plus, students have thanked me for advice on jobs and interviews and some of my posts have even been referenced in doctoral dissertations and talks at conferences. Professionalism is very important. Spend the time to creating a standout Linkedin page. This theme was emphasized throughout the day. Sometimes it may be your outside activities on the page that create interest and may help you professionally as Victoria Vega noted in the afternoon Building your Brand panel. She was interviewed by a national magazine because she had put as one of her hobbies being (sic) fancy cars on her Linkedin page. Update it periodically and show your leadership positions. Elizabeth Morgan, a panelist in the Building your Brand II panel in the afternoon, who works for IBM said that, since her first job, she has not had to ever apply for another one and that has been due to excellent networking (which clearly Linkedin, if used engagingly, can provide opportunities for). I also emphasized the importance of serendipitous meetings that have evolved into great professional opportunities - such as a seatmate on a plane from Logan to Europe who then hired me to teach in Executive Education at Harvard because we had such great conversations on what could have been a tough flight since I had a middle seat. Be open-minded, friendly, and get out of your comfort zone. If you see that there is something missing or needs to be done, be entrepreneurial - that is why I founded the Virtual Center for Supernetworks, for example, and applied for grants, which were awarded and helped to establish it. Do give back and do good. The importance of volunteerism and community service and the associated personal rewards were note. Natty Hoffman gave some great advice. She had worked for years for a big company (IBM) and now was working for a startup in the Boston area. She spoke about how enjoyable and rewarding working for a startup could be and that each student should figure out what kind of organization would be ideal. Some are better suited for a large corporation and others not. I worked for two high tech consulting companies in gorgeous Newport, Rhode Island, while I was pursuing my Master's at Brown University (yes, the companies were paying my tuition). These companies were fairly small but had outstanding benefits and because of my work I got to speak at a conference in Monterrey, California where many Admirals were present. The work involved software development for submarines and later even research on networks, always my passion! Don't just join clubs, but be a leader, and even establish new clubs. Always have integrity and never compromise it. Develop as many skills as possible, from quantitative and IT ones, to more qualitative ones, such as communication skills, both verbal and written. Take the time to write Thank You notes - the personal kind and not just email versions. This I had mentioned on our panel and then the second keynote speaker, Kelly O'Kane, also emphasized this. Great manners can differentiate you. Kelly even said that, after an interview, when she got the job, she saw that those who had interviewed her had posted her Thank You notes in their cubicles. One said that this was the first such note he had received in 2 years! Your life can take different paths and directions but your brand stays with you. Thanks to the Women in Business at the Isenberg School of Management for organizing such a successful and thought-provoking conference and congratulations! Congrats on an Extraordinary Women in Business Conference at the Isenberg School Today! The 2015 Women of Isenberg Conference took place at the Isenberg School of Management today and it was extraordinary! I salute the Women of Isenberg Student Planning Committee: Lauren Cacaceli, Abby Wells, Mary Lynch, Diana Cioccolini, and Casey Gover for a conference that will be hard to top in terms of organization, attention to detail, stunning programs with photos and speaker bios, fabulous panels, great networking events, delicious pastries and refreshments plus fresh fruit, and a fabulous luncheon buffet - with salmon and roasted potatoes and chocolate torte with fresh cream for dessert. The Isenberg Women in Business Club were behind this second annual conference with support provided by the Career Center and Development. Alums came from throughout the Northeast to speak as panelists and provide advice to students and other professionals. The program was crafted to be stimulating with an opening keynote speaker, Nicole Simeral, in the morning and Kelly O'Kane at the end of the conference. Nicole's company was voted Best of Boston 2014 and you can read more about her here. Kelly graduated from the Isenberg School in 2010 with a degree in Finance and recently heard that she was accepted into the MBA program at Stanford. There were several panels to choose from in each time slot and I wish that I could have attended them all! Our Dean, Dr. Mark Fuller, had opening comments as did our Undergraduate Associate Dean, Dr. Linda Shea. Below I share some photos from this great day! You can see from the above photos that there were quite a few men in attendance as well! And we received canvas tote bags with goodies inside - even "branded M&Ms and a water bottle filled with Lindt chocolates. Truly special was also receiving a personal Thank You card from the moderator of my panel: Building Your Brand I, Caroline Malloy, Isenberg '15. Congratulations to all concerned on an exceptional Women of Isenberg 2015 Conference and thank you! And the Women in Business Club raised $30,000 to help make this all possible so many thanks also to the sponsors! 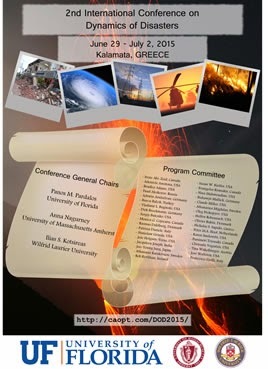 Together with great colleagues, Distinguished University Professor Panos M. Pardalos of the University of Florida, Gainesville, and Professor Ilias S. Kotsireas of Wilfrid Laurier University in Ontario, Canada, I am co-organizing the International Conference on Dynamics of Disasters. The poster for the conference is displayed below. The conference will take place June 30-July 2, 2015 in Kalamata, Greece. The program committee has representatives from numerous countries. Information on paper submissions and deadline is available here. Modelling and mathematics of disasters. I am presently teaching a course on Humanitarian Logistics and Healthcare so a conference such as the Dynamics of Disasters one is very synergistic. There is a tremendous amount of work that remains to be done so I hope that some of you can join us for what should be a very stimulating and engaging plus timely conference. Today, we had the pleasure of hosting Ms. Debbie Wilson, a registered nurse from Lenox, MA, in my Humanitarian Logistics and Healthcare class. Ms. Wilson left for Liberia last September to work with Doctors Without Borders (MSF) for 6 weeks. Through numerous photos that she took at the Ebola treatment facility, which she helped to set up, after a journey that included plane travel, travel by truck, and then by canoe, she vividly demonstrated to the students in my class and a few invited guests and me the criticality of logistics in providing support to healthcare professionals battling the biggest outbreak of Ebola in history. She spoke about helping to set up the Ebola treatment facility for 120 patients, the importance of medical supplies and equipment, which would have to be delivered from Geneva, Switzerland. She talked about her personal experiences donning the special protective gear with hygienists who would then spray the chlorine on her after which she could carefully disrobe. She dealt with temperatures of 100 degrees, horrible rains, insufficient food for the staff - essentially making do with bread and mayonnaise with some ketchup for many meals. She had no fresh fruit her entire time in Liberia. She spoke of how they got rid of the medical waste by burning it in a pit, and once there was an explosion setting off an expanded fire. To hear that it took days for the blood samples to be tested for Ebola with samples being transported over many miles to the nearest lab was touching to say the least and demonstrated how primitive the healthcare system is in parts of western Africa. A lab finally was airlifted by a helicopter and delivered so that testing for the Ebola virus in patients would then take only a few hours on-site. She spoke of the cold chain for vaccines - malaria and Ebola have very similar symptoms, and the importance of educating the population about the disposal of the bodies. Ebola survivors became partners in educating the population over the radio to instill trust and that survival from this horrific disease was possible. She talked about the importance of seeking out village elders to inform them about the important role of the healthcare providers in battling Ebola. This was essential since not far from where Debbie was based, 6 healthcare workers had been stoned to death. We were in the presence today of one of the most courageous women that I have ever met. And, yes, she has gotten another call from Doctors Without Borders to go back to serve. Her resilience, stamina, dedication to relieving suffering and saving lives had us all awe-struck. As one of my students later said to me, her talk was "life-changing" for those who had the privilege of hearing her speak. Ms. Wilson wrote a Letter to the Editor to The New York Times last October that challenged the quarantines for returning Ebola healthcare workers. Since then she has spoken out about many issues, including ethics, and public health and has been the subject of numerous interviews. She wrote this beautiful essay on her reflections on her experiences fighting Ebola in Liberia. We were amazed that the nurses in Africa that she worked side by side with had not gotten paid from September until December - this is so terribly unfair and unjust. People risking their lives on a daily basis under extreme conditions and not even getting compensated for their herculean efforts. As one of the students said, "Where is the government response?" Ms. Debbie Wilson was an extraordinary Professor for a Day at the Isenberg School of Management today and she left an indelible mark on all of us. One person can change the world. We are delighted to announce - so be sure to mark your calendars - that Dr. Radhika Kulkarni, VP of Advanced Analytics R&D at SAS, will be speaking at the Isenberg School of Management on Friday, March 6, 2015, just over a month away! This visit has been in the planning for a while and we are delighted that we will have an opprtunity to welcome Dr. Kulkarni to UMass Amherst. 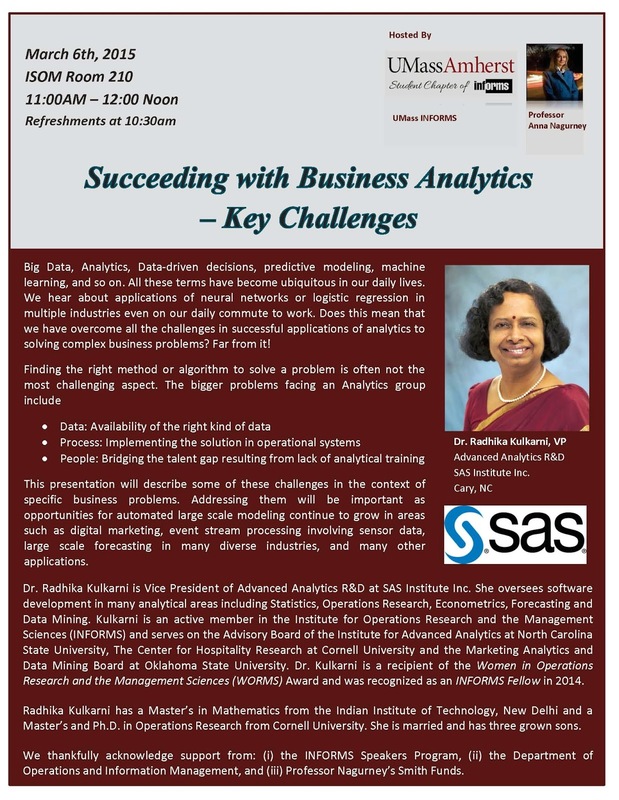 Dr. Kulkarni's presentation title is: Succeeding with Business Analytics: Key Challenges. The officers of the UMass Amherst INFORMS Student Chapter prepared the nice poster below announcing her presentation, which I expect will attract a standing room only audience. I have known Radhika for a while through WORMS (Women in Operations Research and the Management Sciences) and she is the supervisor of one of my former doctoral students, Dr. Padma Ramanujam, whose doctoral dissertation received the best dissertation award from what is now the Transportation Science & Logistics Society of INFORMS. I was a very proud academic mother when the announcement was made. I have visited both Padma and Radhika at SAS's beautiful campus in Cary, NC. That morning we will have a meet and greet with Dr. Kulkarni, followed by a reception, and her presentation and lunch with a roundtable afterwards with grad students. The student chapter and I are very grateful to the INFORMS Speakers Program which is sponsoring her visit, in part, along with my Operations & Information Management Department, with additional support from my Chaired Professorship Smith Funds. Radhika is the recipient of the WORMS Award in 2006 (and when I received the same award the year after, she presented me with the ward). She was elected an INFORMS Fellow in 2014 at our San Francisco meeting. This time around I preceded Radhika since I became an INFORMS Fellow in 2013. Early this morning, after a nice breakfast out, I stopped by with my husband, as I usually do, at the Isenberg School of Management, where I teach, to drop off some lecture notes and to pick up a book. It was about 7:40AM. As we were about to enter the school through the entrance closest to the parking lots we saw three young adults (not UMass students - I asked) exiting (2 males and 1 female). They were quite upset and said that while they were in the atrium they heard a sounds like water rippling and then the noise got louder and parts of the ceiling above the other entrance door collapsed. My husband quickly called 911 and asked to be connected to UMass Police and he shared the news about the water pipe break, most likely due to a sprinkler system. The fire alarm was blaring throughout the building and the fire alarm lights were flashing. When we entered with water around our ankles there was an unpleasant odor such as a mix of rubber. We walked around the school to the other entrance, which is closest to the Whitmore Administration Building and faces a patio. We were greeted by a waterfall over the door with water that was now flowing out both doors and moving past the atrium. One could see part of the ceiling over that door dangling. First to arrive was EH&S, followed by two fire trucks from the Amherst Fire Department, and then UMass police, which we spoke to. They were all on-site by 8AM. Needless to say we also notified several of our Isenberg School administrators and sent over photos, which I have posted below. This event was very disconcerting because directly below the space that was flooded - and the patio outside was turning into an ice rink - are computer labs, a lot of high technology equipment, and computer servers. We received a message from TSS that many of the servers are down and, indeed, I can't get on the Supernetwork Center site that we update regularly. At around 8:30AM or so we were very happy to see Susan Boyer who heads TSS, who had to drive in a ways to campus this morning. She was very concerned about the servers and an email message was sent out to the school. Coincidentally, I am now teaching my Humanitarian Logistics & Healthcare class in which we take alot about emergency preparedness and, yes, even about the winter storm Juno of last week and the importance of accurate weather forecasting, along with business continuity. Speaking with physical plant folks, about the status of the flood at the Isenberg School, they are assessing the situation and the area is closed off. This is a very special place and school for many of us so I hope that operations are restored soon. We have the first guest speaker coming this Wednesday to speak in my Humanitarian Logistics class. I checked my Supernetworks Lab and since it is on the opposite side of the basement in the Isenberg School in a slightly elevated part, it looked untouched by the water. At 9AM physical plant was cleaning up and drying out the first floor part. And, besides it being Super Bowl night tonight another major snowstorm is in the forecast. Times like these, we learn to be resilient and to practice disruption management! Many thanks to the town of Amherst and UMass first responders for arriving on the scene so quickly. Let's hope that our computer servers will also be restored to full functionality soon, as well.